Como Conservatory and Japanese garden offer a chance to connect with nature through carefully maintained gardens. As our gloomy spring weather continues, a quick trip to the tropics seems in order. Thanks to the Como conservatory right here in Saint Paul, I don’t have far to go! Como’s facilities have been undergoing renovation and expansion for the past couple of years. This is my first look at the results and some of the changes are immediately obvious as we approach the conservatory . . . starting with the fact that the entrance has been moved to a consolidated visitor center that serves both the gardens and the zoo. To get to that entrance, I have to pass (and stop to photograph) the long narrow water garden that wraps around the conservatory and the new Ordway Gardens wing. While the lack of spring this year means there are very few water lilies in evidence, the pools provide plenty of interesting reflections of the conservatory itself. 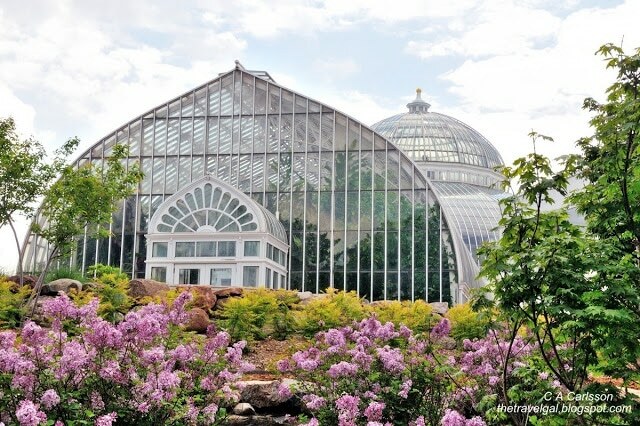 The Marjorie McNeely Conservatory opened in 1915. It’s a classic, graceful structure at the heart of the conservatory complex. However, the new Ordway Gardens expansion provides additional space to for both indoor and outdoor bonsai displays, as well as an enclosed viewing area overlooking the Ordway Japanese gardens. It also connects to the main visitor’s center, creating a ample space for visitors moving between the zoo and the gardens. Inside, the fern room provides a leafy green oasis around a small pond. The center of the conservatory still houses the palm collection, along with various orchids and tropical blossoms. This tropical theme continues in the North Garden and its collection of both beautiful and “useful” tropical plants. The sunken garden, with its regularly changing floral display, seems to be the most popular part of the garden. This is where visitors can linger amid brilliant colored blossoms. One reason for expanding the conservatory was to provide seasonal external space for the bonsai collection. The bonsai area also provides entry to the Ordway Japanese garden, designed by Masami Matsuda, a renowned landscape designer from Nagasaki, Japan. It was opened to the public in 1979 and renovated under Mr. Matsuda’s direction in 1990-1991. (It’s unclear exactly when the original garden was installed, although it appears it was developed many years earlier on a site that is now part of the golf course.) The garden has been closed for the past year and has only recently opened again, now with realigned views. While the gardens did not provide a particularly peaceful place for reflection, they were lovely and the sun had come out by the time we finished our tour. It was a successful, if quick, visit to the tropics.